Crystal Antlers: reflections, refinements, and now what?! While sorting through cyber-mountains of files during re-entry to the Luxury Wafers atmosphere, I ran across this video of one of my all-time favorite sessions: Crystal Antlers. Oh man. Awesome. Details of the session are blurry in my memory. From the calendar, I know it was late afternoon in July of 2009. I do remember waiting a couple of hours past the arranged time for them to arrive at our studio in the blazing San Fernando Valley. 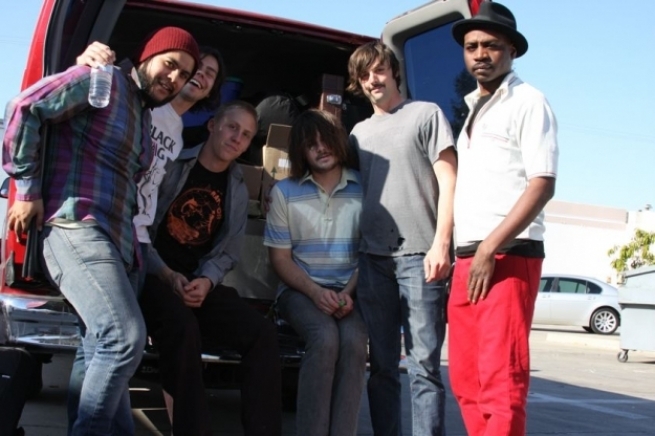 After a while, antsy and curious, I ventured out into the heatwave to look for them, only to find the band and friends huddled contentedly in their van in the parking lot. I waved at one of the guys behind the passenger side glass. He waved back, rolled down his window and smiled. I asked, “Are you guys Crystal Antlers?” He answered in a friendly fashion, “Yeah.” Me: “Are you planning to come in the studio for a session?” Him: “Yeah.” That was it. A funny little vignette. Within the next ten minutes or so, all the members flowed in, set up, and then began to pound out their signature hard, hypnotic, animal groove, to which singer, Jonny Bell wailed in absolute aching, soulcracking pleas. Go watch/listen. Crystal Antlers – Luxury Wafers Sessions – Memorize from Luxury Wafers on Vimeo. The entire session, with 5 tracks you can download free, is HERE. Folks have said they favored these live recordings to Crystal Antlers’ record, Tentacles (Touch and Go/Rough Trade, 2009). You could always buy the LP, download the tracks, and compare… Just sayin’. So what next for these rogue sweethearts? We’ll be eagerly awaiting the new stuff. As lovable as this crew can be, I don’t think we should be too worried they’ll forget their broken-glass edge that so ferociously compels the ears and heart.